BMW added a new entrant to its all rounder X series range, the BMW X4 – 'Sports Crossover', the vehicle is sharing its DNA with X3 SUV. 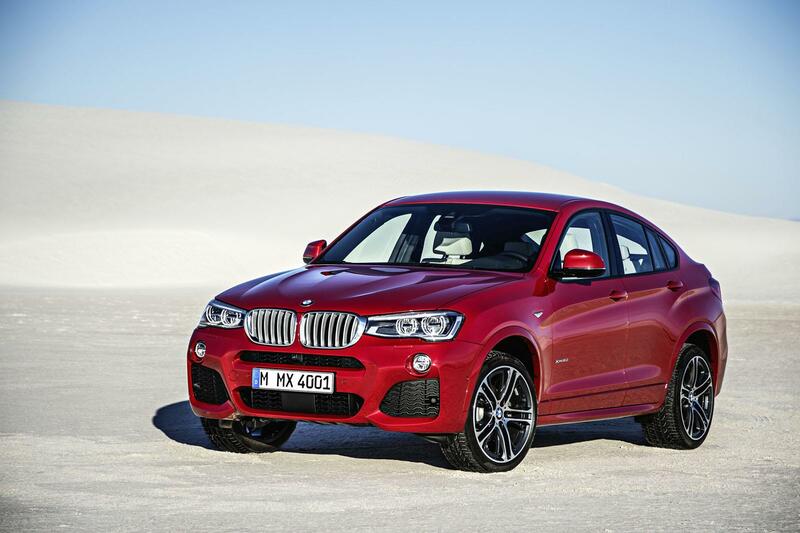 X4 will go on sale in second half of 2014 in US, expect the to car to land in India around early 2015. BMW showcased X4 Concept last year at Shanghai Motor Show and as per the images from BMW the production version is retaining almost every detail! The car borrows X3's chassis while X6's 'coupe roofline' and turning out to be a 'sports crossover'. Although the car is based on X3 but the X4 is 14mm longer and 36mm lower than compared to X3. Speaking of the front, the twin kidney grille is in command flanked by an optional 'Adaptive LED lighting' option; flaunting angle eyes and twin round headlamps layout echoing its siblings in the clan. The dropping roofline side profile mimics that of X6 while the back sports 'L' shaped LED wraparound tail lamps. The front bumpers sports large honeycombed air intakes and circular fog lamp housing while the rear bumper boosts dual tone layout with faux air diffusers and twin exhaust pipes. The notchback styled rear has integrated boot lid spoiler. Powering the crossover will be the range of in-line six and four cylinder petrol and diesel twin turbo motors. As far as India is considered X4 will share its powertrain with the X3 currently on sale in the country. The 2.0 litre twin turbo diesel churns out 184bhp and 380Nm and a more peppier six cylinder in-line 3.0 litre produces 258bhp and 560Nm. Both the engines will be coupled with a 8 speed Step-Tronic Sports transmission with paddle shifters. The vehicle will come in three driving modes namely, comfort, sports and sports+. To pamper you the car is equipped with BMW head-up display, BMW driving assistance, Navigation system professional along with iDrive touch controller and surround to name a few! BMW India is currently focusing on the launch of 3 Series GT in the country, the company has already started taking bookings for the same. Expect this crossover to arrive early 2015.